Football is a game of numbers. Touchdowns, field goals, safeties, turnovers, yards per game, carries, receptions — these all have values that can be added and subtracted, and they lead to the total tallies in the win and loss columns. For Notre Dame, a team with hopes each year of keeping that loss column clean, the quarterback duel has become more than a choice between two simple numbers, 5 and 8. It’s come down to something of a science. The Irish coaches expect their players to keep their grades up in the classroom, and now they want their starters to make the cut on the field as well this spring — even though head coach Brian Kelly said the final decision probably won’t be made until fall camp. Sanford explained that the system essentially rewards or penalizes quarterbacks on if they did their job on a play and said he hopes the new system will keep the competition from turning into a controversy between graduate student Everett Golson and junior Malik Zaire. Zaire said moving past just film and looking at the numbers — “something that sticks with you a little bit more” — help him and his teammates figure out where they need to improve. While Irish coaches have developed a more complex way to gauge the quarterback competition, they’ve also decided to get back to basics to develop both their signal callers as much as possible during Sanford’s first year at Notre Dame. “When [Chuck] Martin was running the offense, there was a real focus on the quarterbacks and protections and really being cognizant of how to protect themselves. … With [Matt] LaFleur, it was concepts, concepts, concepts. … Those two things they are really good at,” Kelly said. “Some of the fundamentals, which we saw were exposed last year, are the areas that Mike Sanford is really strong at. Football is a game that plays out on the field, between teams whose players have specific training regimens developed for them and undergo Bod Pod scans to assess their body fat percentage. But it’s also a game in the mind, filled with plays and schemes and quick reads right before the snap. 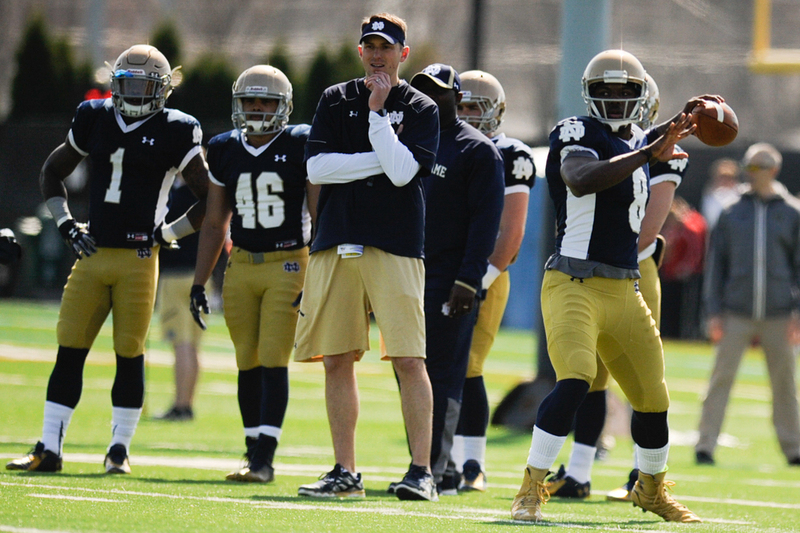 When it comes to that mental aspect, Kelly indicated Golson might have a leg up. Sanford said Zaire was “very coachable and very zealous in wanting to learn and correct everything,” but he also admitted Zaire’s enthusiasm can be problematic at times. Irish offensive coordinator and quarterbacks coach Mike Sanford watches as junior quarterback Malik Zaire winds up for a pass during Notre Dame’s practice last Saturday at LaBar Practice Complex. That won’t keep Zaire from looking for full autonomy when it comes to getting the first snaps of the season opener against Texas on Sept. 5. Zaire earned the start in last season’s bowl win against LSU, but he and Golson switched off behind center and split time on the final, game-winning drive. The left-handed gunslinger said he doesn’t want to adopt that game plan this season — it’s all or nothing. No matter if he wins the starting job or not, Zaire said his mind is centered around one objective, the same goal he’s had during all his time at Notre Dame. Rumors swirled after Notre Dame’s bowl win that Golson, who had started every game in 2014 before Zaire usurped him in the finale, was considering a transfer next fall. While Kelly said he wouldn’t be surprised by anything a college-age player does, he does not foresee handing the starting job to Zaire based on Golson’s absence in South Bend. Golson himself has remained mum since the bowl game, declining to talk with reporters, but Kelly said he trusts his quarterback’s decision. Irish junior quarterback Malik Zaire (8) looks on while graduate student Everett Golson (5) prepares to toss a pass during a drill at LaBar Practice Complex last Saturday. Sanford said he’s noticed that commitment in Golson as well, even in just the few weeks that make up the spring slate. Golson has 23 career starts under his belt compared to Zaire’s one, but an array of late-season fumbles in 2014 proved he’s far from a perfect quarterback. 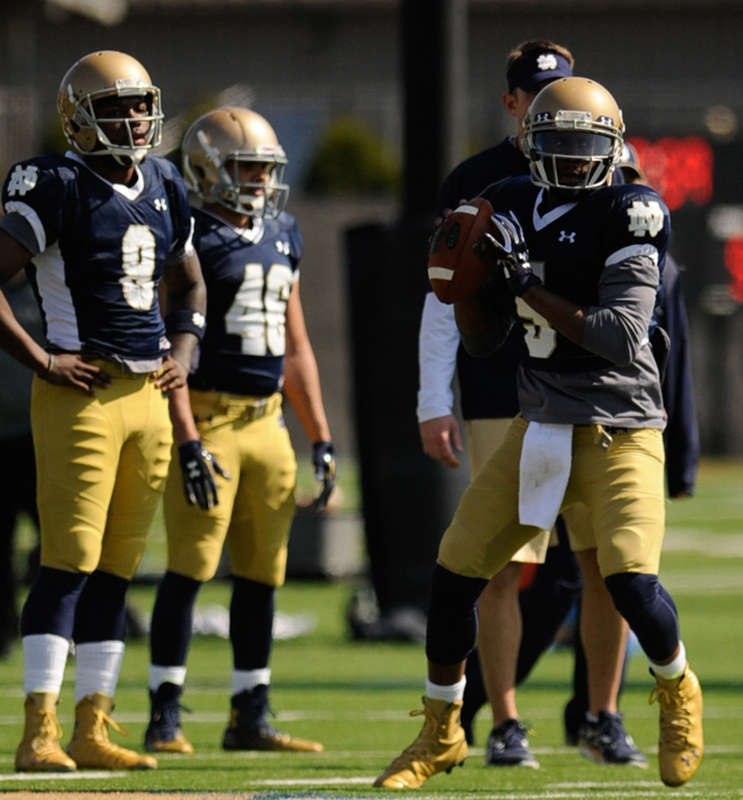 Kelly said Golson’s pocket presence has been a point of emphasis this spring. As with Zaire, Sanford said he’s trying to tone down Golson’s eagerness in certain situations. No matter who’s under center, the rest of the team won’t get caught up in the final decision. “For us, speaking as a whole, it doesn’t really matter to us,” graduate student receiver Amir Carlisle said last Friday. “Both guys have done great things. Everett did great last year for us. Malik did a great job finishing last year for us. Kelly added the Irish want a leader who will be willing to give his all to collect a win each Saturday. Even with a close decision ahead of him and his staff, Kelly said he knows they have enviable talent from both candidates — no matter what the final numbers say. “In terms of depth, I don’t know that anybody has a better situation than we do with the two quarterbacks that we have,” he said.